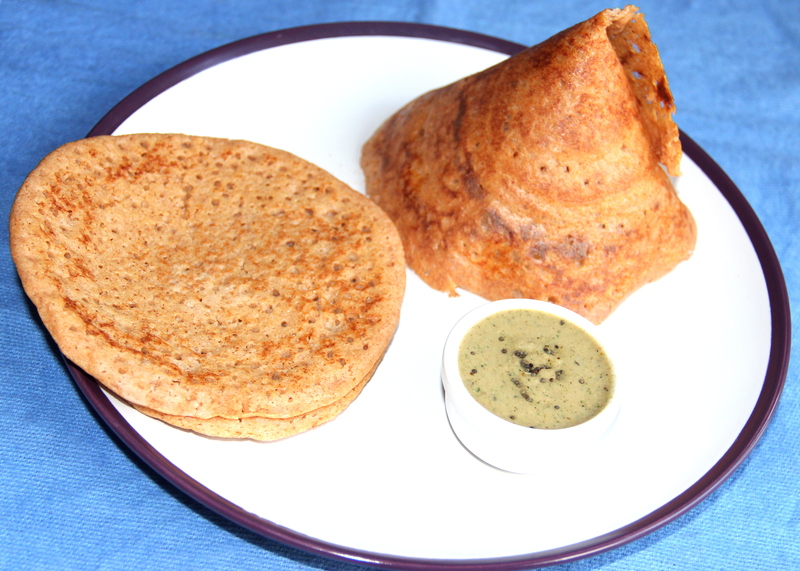 Dosa is a pancake/crepes like dish made by blending rice, split gram dal but can be personalised as per the taste and preference. I have made these dosas by blending red rice, split black gram dal, barley, flatten rice and carrots. Adding carrots makes it more nutritious and tasty. Red rice is similar to brown rice and rich in fiber, barley and wheat combination helps to control glycaemic index. Wash and soak all the ingredients mentioned except carrot for 5-6hours/overnight. After soaking time drain and set aside. In the food processor add carrot and blend to puree and to this add soaked and drained ingredients in batches; Blend it to the smooth batter by adding little water at a time. Transfer the ground batter to the bowl, cover and let it ferment for 6-8hour in the warm place. Add salt and adjust the consistency by adding water and mix well. Make thin spread with the back of the ladle from centre in a circular motion towards the corner of the griddle. After fermenting the dosa batter stays in the fridge up to a week. Better to make it in batches as once salt is added batter doesn’t stay for long. Can use regular rice instead of red/parboiled rice. 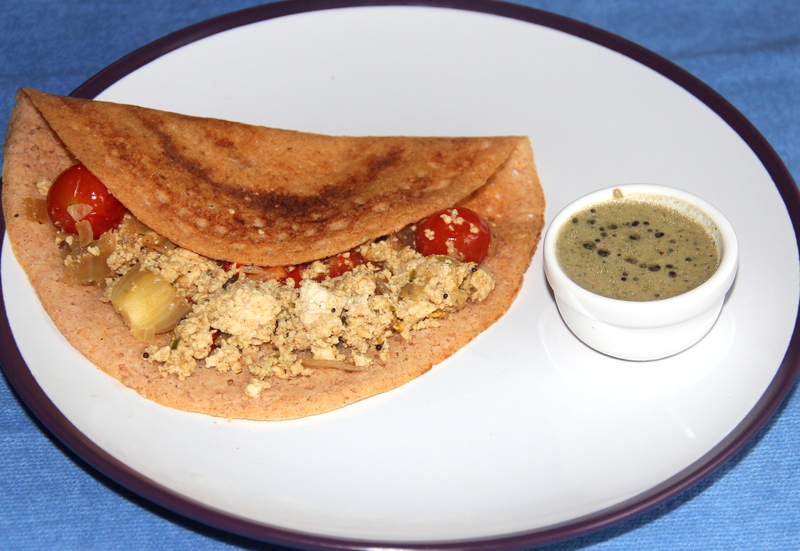 Posted on July 9, 2014, in Breakfast, Indian, Main dish and tagged Carrot Dosas, Chitras healthy kitchen, drchdietfood, Healthy crepes, Healthy dosas, Healthy masala dosas. Bookmark the permalink. 30 Comments. Look wonderful and sound healthy Chitra! Thanx lori…..how are you?It’s been long since you posted? Hope everything is fine…..
You are sweet to notice Chitra! Everything is going well, just been very busy. I appreciate you thinking of me! So sweet! These look delicious. I am so excited about finding your blog. I adore Asian food and want to learn more about it. Have a great day. Emma. Thanx Emma for such encouraging words which makes me explore more on dishes…..glad to know you love Asian foods. ….wil try my best to keep it up….you tooooo have a lovely day…. Awesome, Chitra! I have tried adding grated carrots to the batter, but this sounds even better, grinding with the vegetables. Good to know that it will ferment well. Will try this method. How does barley addition help, do you know? Yes Apsara even I tried this for the first time and it turned out good….barley is a cereal grain, adding some of it in dishes increases the nutritional benefits…..
Never thought of carrot with dosa batter. Super idea Chitra! What a beautiful & healthy dish!